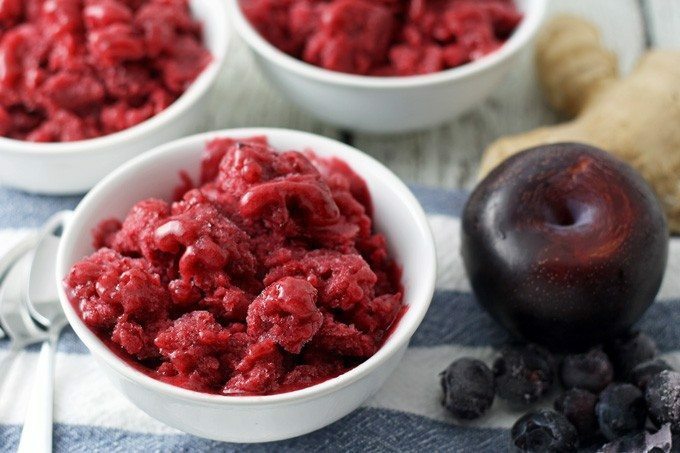 This plum blueberry ginger granita is the perfect way to end a barbecue. Make this sweet treat the day before so you can just enjoy the party! Summer in Chicago is also barbecue season! We spend so much time in the fall, winter and spring cooped up that once the weather looks a little warm, we all flock to our yards/porches/tiny balconies. I’m pretty lucky to live in Chicago and have a yard and we only have to share it with our awesome upstairs neighbors. Needless to say, we have been dining outside as much as possible and Mr. B has been grilling every second he can. Because I usually let him man the grill, I like to spend my time making desserts that are perfect for barbecue season. 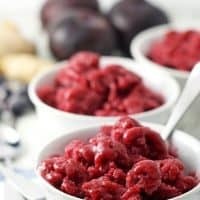 Today’s recipe, a plum blueberry ginger granita, is the perfect way to end a meal on a hot, Chicago summer day. It’s also a great way to use up some of your farmer’s market or CSA bounty! If colors could be delicious, ripe plums would be my favorite. When cooked, they turn the most delicious reddish-purple color. 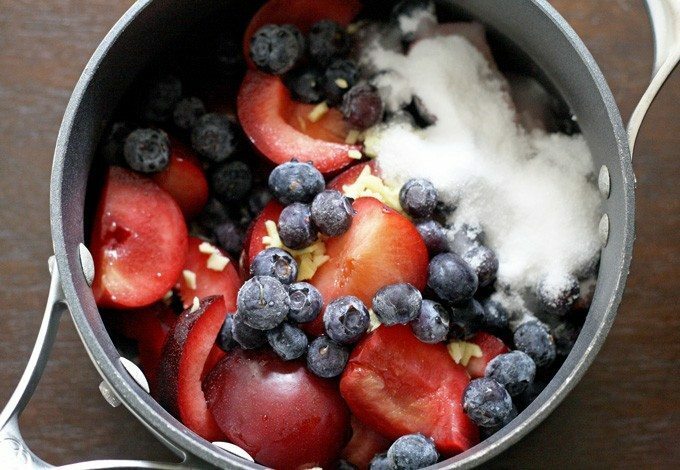 Add in blueberries and you’re going to feel blessed with deliciousness. Granitas are pretty easy to make. 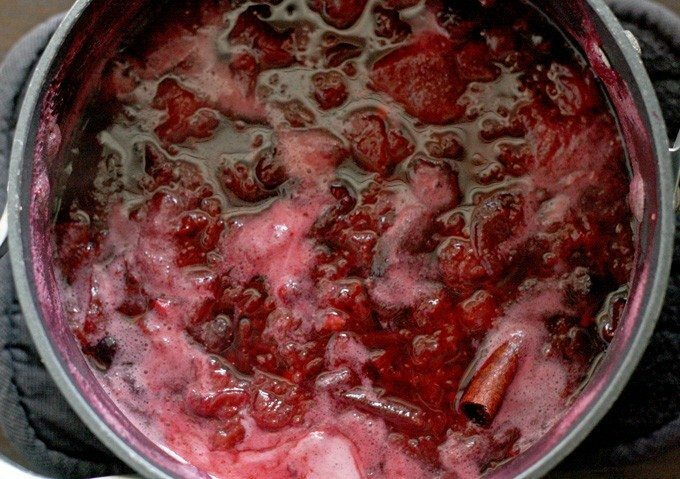 Basically, you puree fruit with water, sugar and spices and then freeze it. Scraping it every 30 minutes or so keep it from freezing solid. 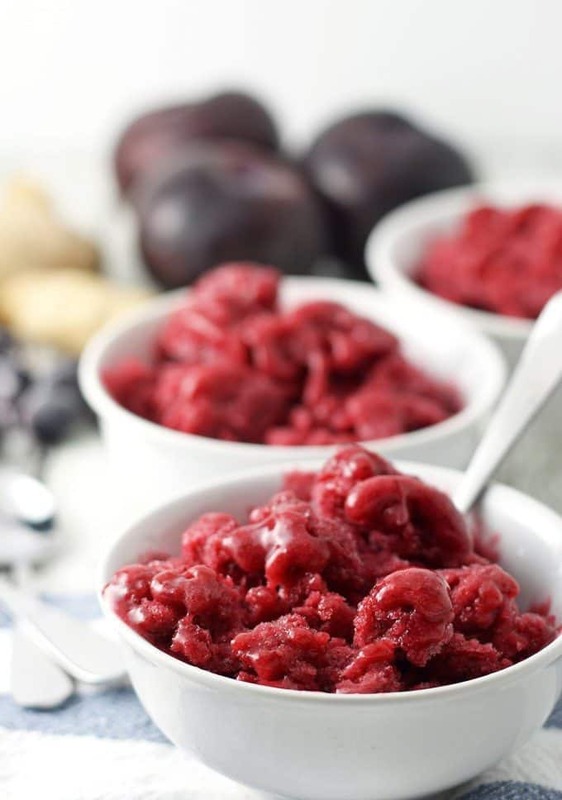 For this plum blueberry ginger granita, I used Ebony Treat plums and frozen blueberries. I let the blueberries defrost a little bit but since I was planning on cooking all of the fruit together, I wasn’t too worried about the temperature. This type of dessert does melt pretty fast. 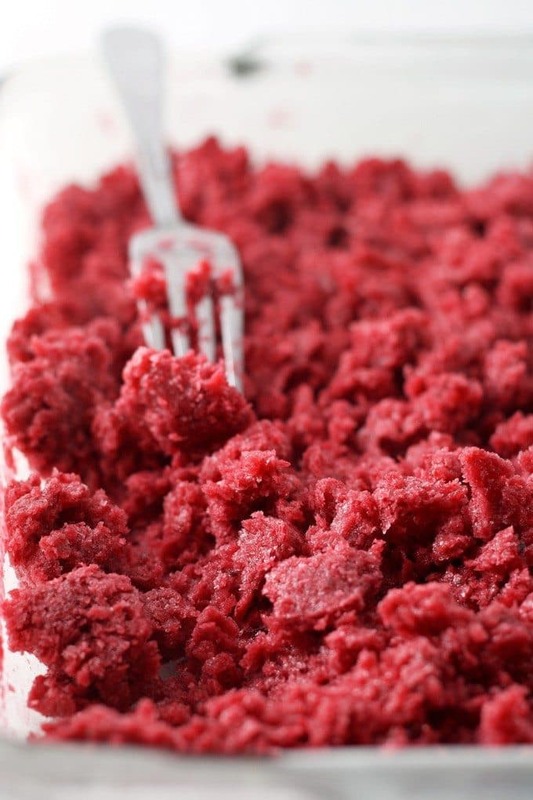 I recommend keeping it on ice and scooping it out right before you are ready to serve it. In a medium pot over medium heat, bring all the ingredients to a boil. Reduce the heat and simmer for 15 minutes, stirring occasionally. Remove cinnamon stick and let cool. When cool, blend mixture until smooth. 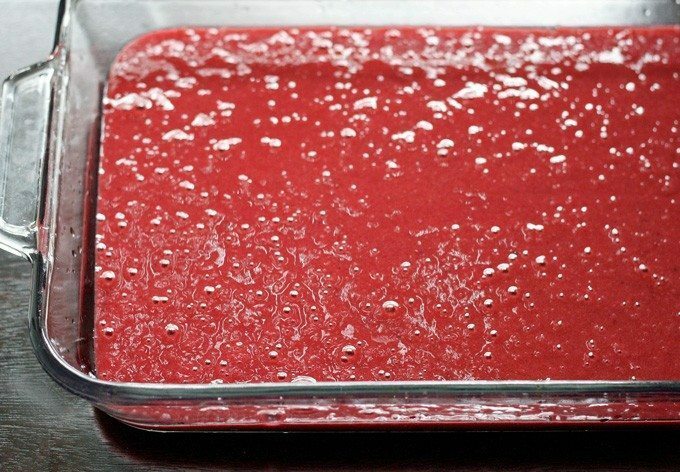 Pour into a shallow glass dish and put in the freezer. Every 30 minutes, scrape the mixture with a fork. 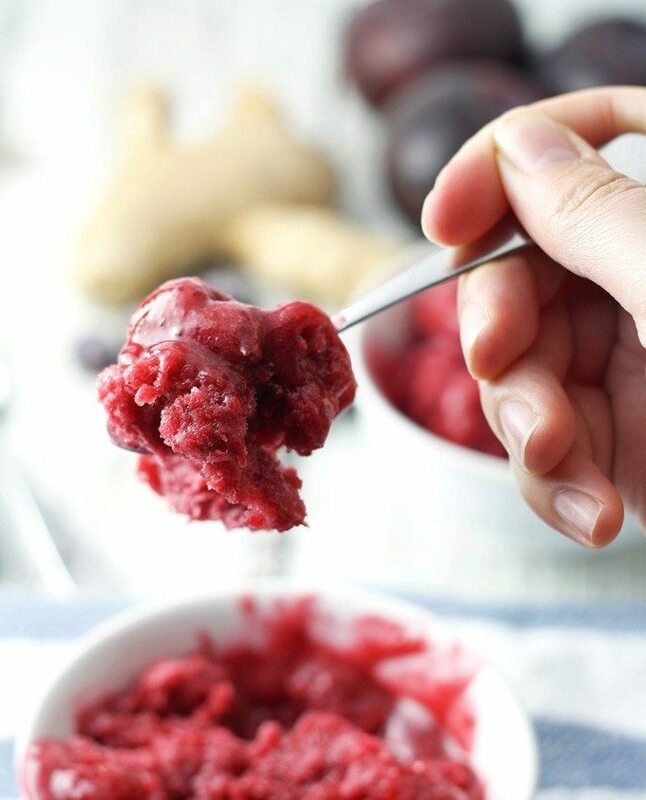 Repeat until the fruit puree is completely frozen. 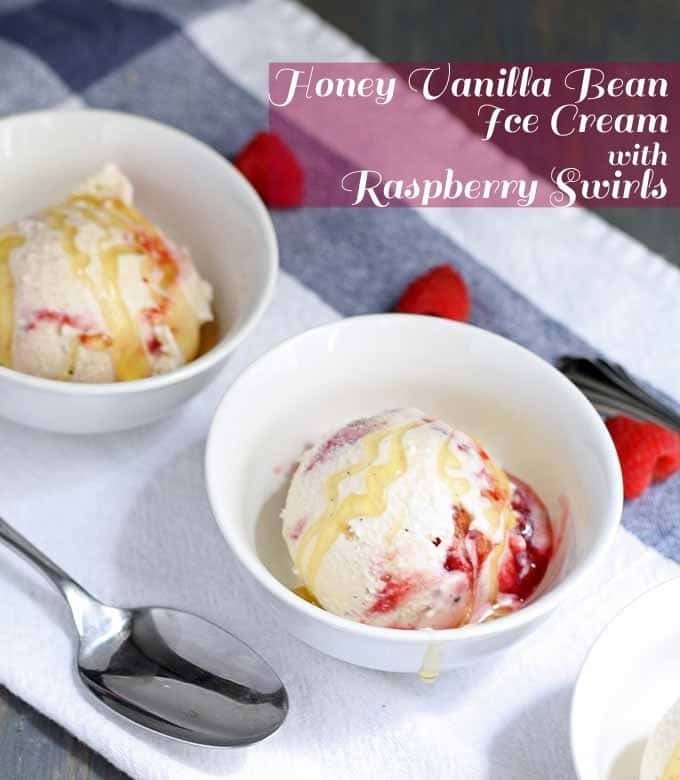 Serve with an ice cream scoop. Be sure to check out the other bloggers’ recipes! If you’re looking for more cold sweet treats? or this honey vanilla bean ice cream! Jenny – this looks absolutely delicious. The color is gorgeous and and I love plums, don’t use them enough. Can’t wait to try this refreshing dessert for our next barbecue. Thank you Allie – I definitely think plums should be used more often! Wow…that looks go good. Refreshing! and the recipe is so simple. Love it! WOW! Gorgeous photos, this just looks spectacular and so SUMMER-Y! Can’t wait to try. Looks like a perfect treat to beat the heat. It is suppose to be in 100’s next week. Oh beautiful! So vibrant! I might actually make a granita for the first time now! Thank you Melissa! 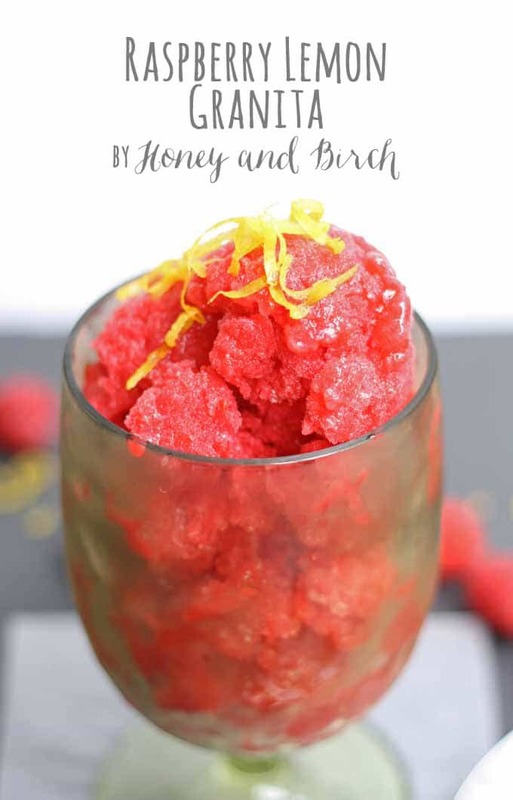 You’re gonna love granitas – they are very easy to make! I don’t do well with blueberries, former allergy, could I swap out for blackberries? If you use blackberries, I would probably go with a cup and half of the berries. Also, you could substitute raspberries as well! Hope you enjoy! The flavors in this are sensational!!! I wish I had this right now! Love the flavor combination, so refreshing! I love granitas! They’re such a refreshing summer dessert! This looks like the ultimate summertime treat. I like that you added ginger to boost the flavor, smart idea! What a great dessert, bright and fruity, for the summer time! I love that you can make it ahead of time and forget about it until time to eat! I like ideas like this that let me enjoy time with my guests instead of spending all my time in the kitchen! Thanks for linking it up to Saucy Saturday! This looks so good and perfect for a hot summer day! Thanks so much for sharing your recipe with us at Share The Wealth Sunday! Those flavors sound amazing together! Thanks for sharing on the What’s for Dinner Linky! What an elegant and refreshing dessert! I would never have thought to use plums in an ice like this. The color is just gorgeous. Thanks for sharing on Family Joy Blog Link-up Party! Have a great week! Oh goodness, this sounds so delicious and refreshing! I just walked pact a display of plums at the store the other day adn they smelled so good. This is something I have never heard of before. It looks delicious. I like that it’s made with healthy items. I could probably eat the whole thing by myself. It’s so hot here in Texas, this is the perfect cool down dessert. This looks amazing! I think it’s my new fave granita. Thanks for sharing with us at Throwback Thursday!